Okay, so today was an absolutely beautiful day! The kids were playing and Shana and I were enjoying the sun in the front yard. I put my arm down on the arm rest and… OUCH! Stupid thorn. I looked and there wasn’t anything on the arm rest. I put my arm down again and it was still hurting. 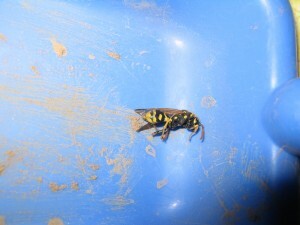 That’s when I noticed the STUPID WASP with his STINGER IN MY ARM!!!! OUCH! I don’t remember ever being stung before! It hurts! :*( Shana (who’s allergic) smooshed it for me and made a baking soda & vinegar mixture. I finally figured out where the puncture hole was so she put it on and covered it with a Princess bandaid. It helped with the sting. I decided to take a picture of the little stinger…I mean stinker…before I flushed him (to make sure the kids didn’t step on him). Spencer is cursed with hurting his arm. 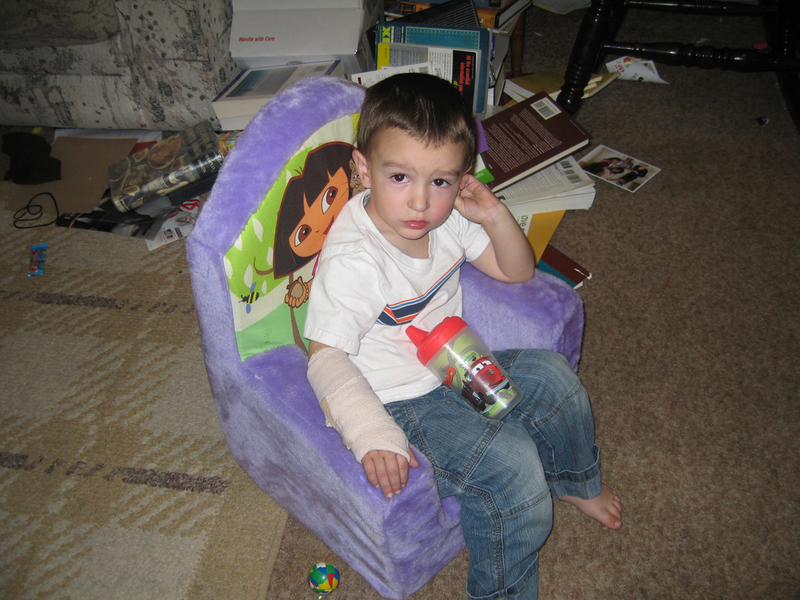 He hurt his arm again last night, although he wouldn’t tell me what he was doing when it started hurting. I asked him if he wanted me to wrap his arm in a bandage and he agreed. What a sad little face!